The Health Protection Agency (HPA) recorded 971 cases during the year - up from 740 in 2006. MMR immunisation rates dipped following research which raised the possibility that the jab may be linked to an increased risk of autism. However, the research has since been debunked, and a string of studies have concluded that the triple vaccine - which protects against rubella and mumps as well as measles - is perfectly safe. The latest figures show that there were 272 confirmed cases of measles in the final quarter of 2007, compared with 412 the previous quarter. The HPA report said most reported cases of measles were associated with outbreaks in travelling and religious communities where vaccine uptake has been historically low. There have also been numerous smaller outbreaks in nurseries and schools. Most of the measles cases (79%) were in children under the age of 15. A total of 90 cases were among children under one, 312 were in one to four-year-olds and 237 cases were in five to nine-year-olds. Among those aged 10 to 14, there were 128 cases, according to the HPA. During 2007, 73% of cases were reported in south eastern England, with 424 cases in London and 159 in the East of England. 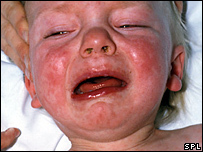 Dr Mary Ramsay, a HPA consultant epidemiologist, said: "This increase in measles cases is of concern. "Although MMR coverage is starting to improve, we know that large numbers of children are still not fully protected. "Therefore we expect to see more large outbreaks of measles in the future." Dr Ramsay said the difficulty was predicting when and where the outbreaks would occur. "The only way to reduce the impact of such outbreaks is to ensure the uptake of the MMR vaccine increases, and that older children who have missed out come forward for vaccination. "Our main focus is to remind people that they need two doses of the MMR vaccine to be fully protected. "Anyone who has not had two doses could be at risk of this serious infection." A spokeswoman for the Department of Health said: "MMR uptake has increased in recent years - now about 17 out of every 20 children have the MMR vaccine before they are two years old. "We want to see more children protected against these potentially serious diseases."